A fully featured Double Ventile® Jacket ideal for extreme conditions. The back of the arms & elbows and shoulder areas are reinforced for increased wear resistance when carrying heavy rucksacks or skis. The waist, hood and hem are adjustable to protect from the ravages of weather. The jacket features multiple pockets for storage of maps and all the essential kit you like to keep close to hand. Named after The Cuillin (Gaelic: An Cuilthionn). This is the iconic mountain range on the Isle of Skye in the West of Scotland which are alpine-like peaks above sea lochs. Find out more in our Glossary. "Despite the sun the temperature was about -15C with a stiff breeze so wind chills of around -25 to -30 C. The jacket was superb." Read one Hilltrek customer's review of the Cuillin Jacket in our Blog. This is the ideal jacket for a range of cold weather activities. 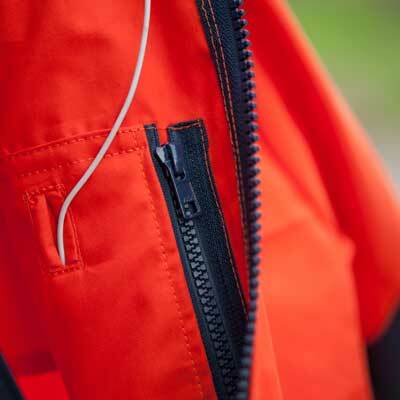 See the Askival Cotton Analogy® Jacket for a similar Cotton Analogy® version. I can only describe this jacket as the most confidence inspiring piece of kit that I have ever owned. It is of superb build quality and the customer service at Hilltrek is very good, so much so that I have ordered two modified Kintail shirts for next spring. Would definitely recommend. Received my new Cuillin DV a few days ago and very pleased with the fit and quality of the jacket. I opted for the royal blue, which looks a bit darker than on the website, but it's always difficult to match colours friom photos-it's a nice understated colour which works equally well on the hill, travelling or commuting. The lower pockets are angled for easy access, while the two top pockets are reverse welted. Big map pocket, but this is inside the jackets so you need to open the front to access, probably would have been better under the front stand but I guess this a more complicated manufacturing feature. Being double ventile, it'll be best used for winter I guess and very much looking forward to taking it out on hills this autumn and winter. Hilltrek are a very friendly company and easy to communicate with and have great customer service.